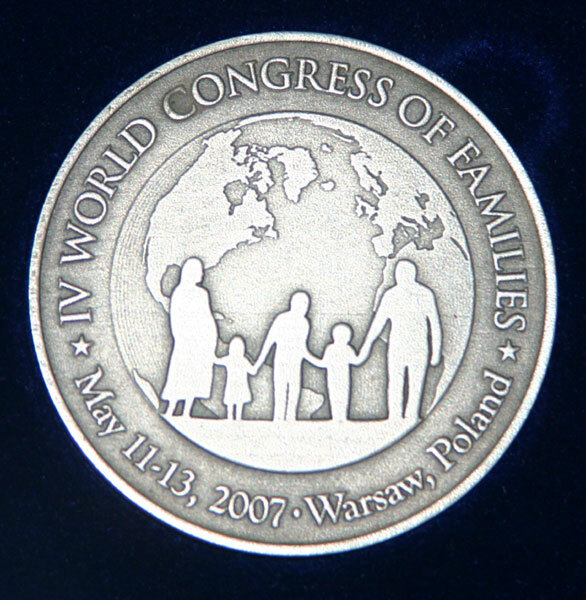 On May 11-13, 2007, the World Congress of Families IV was held in Warsaw Poland. It gathered about three thousand nine hundred participants, including three thousand three hundred registered representatives from 64 countries of the world. One hundred fifty speakers spoke in five halls and were all translated simultaneously into 6 languages. There were 140 journalists accredited. In the exhibit area, over fifty organizations were present. To commemorate this important international event a special medal designed by Jacek Mazela from Mazela Centrum Grawerskie was minted. The medal is round with a diameter of 55 mm. On the front side in the central area the logo of the world congress is placed – a family holding hands with the world globe as background. Around the logo, these words are inscribed: (Polish) "IV �WIATOWY KONGRES RODZIN * 11 - 13 Maja 2007 Warszawa” or (English) “WORLD CONGRESS OF FAMILIES IV * May 11 - 13, 2007 * Warsaw, Poland”. 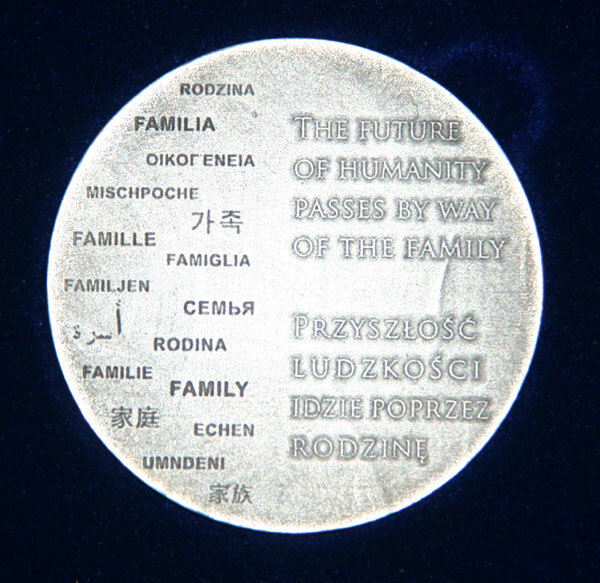 On the reverse side the word “family” was placed in many languages and the motto of the Congress in Polish and English: PRZYSZ�O�� LUDZKO�CI IDZIE POPRZEZ RODZIN� (THE FUTURE OF HUMANITY PASSES BY WAY OF THE FAMILY). - 10 Polish language version marked with the symbols from “IV �KR 01 Ag” to “IV �KR 10 Ag” and the Polish Hallmark. - 11 English language version marked with the symbols from “IV WFC 01 Ag” to “IV WFC 11 Ag” and the Polish Hallmark. - 10 Polish language version marked with the symbols from “IV �KR 01” to “IV �KR 10”. - 85 English language version marked with the symbols from “IV WFC 01” to “IV WFC 85”. An additional 200 bronze non-numbered medals were minted for WCFIV speakers and VIPs. For sale among the participants, 208 non-numbered copper silver plated medals were prepared. 53. IV WFC 22 o. Bronis�aw Staworowski OFMConv.